The diverse selection of fabrics at Honey Bee Quilt Shop in Austin reflects that city’s celebration of the eclectic. At Honey Bee Quilt Shop in Austin, shoppers can choose from an array of fabrics, patterns, and samples. Shop owner Dianne Ferguson stocks the quilt shop with a spectrum of options that reveals the diverse styles of her customers. Front row, from left: Debbie Balagia, Kayleigh Ferguson, Dianne Ferguson (owner), Jan Tedrow, Ann Marie Grzinich; back row: Osie Lebowitz, Kerry Olson, and Sue Carter. Stitched samples notions, patterns, and fabrics surround shoppers at Honey Bee Quilt Store. On the fourth Saturday of every month, Honey Bee Quilt Store hosts Charm School, where students sew projects using 5-inch squares. Many area quilters participate in the shop Thimbleberries Quilt Club and Thimbleberries patterns and fabrics are showcased in one corner of the store. 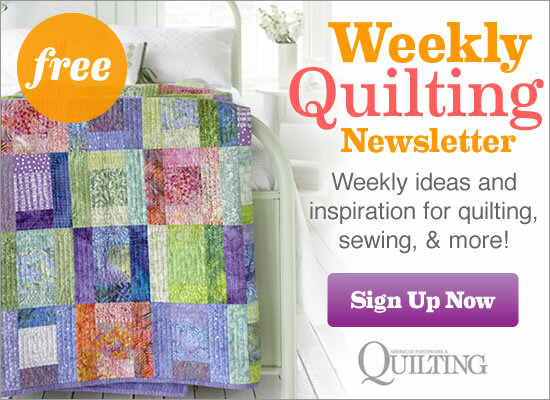 Designers at Honey Bee Quilt Store created Falling Water for Quilt Sampler® Spring/Summer 2012 magazine. A beautiful batik blend cascades down a wall hanging of Four-Patches and dimensional triangle-squares. Angela McCorkle machine-quilted 1/4” inside the straight edges of each triangle unit and added curved diamonds in each cream batik 2-1/2” square. She quilted the blue batik squares with a feather motif and filled the vertical cream batik areas with feathered vines and dense stippling. In the open cream area at the bottom of the quilt, she stitches a row of stemmed flowers surrounded by a dense pebble pattern. In the Falling Water color option, quilt tester Laura Boehnke utilized bright fabrics that feature floral and geometric prints in place of the batiks in the original. Laura chose nature-inspired fabrics that add bold pops of color. Fabrics are from Poetica from Art Gallery Fabrics. For more information about Honey Bee Quilt Shop, visit honeybeequiltstore.com.